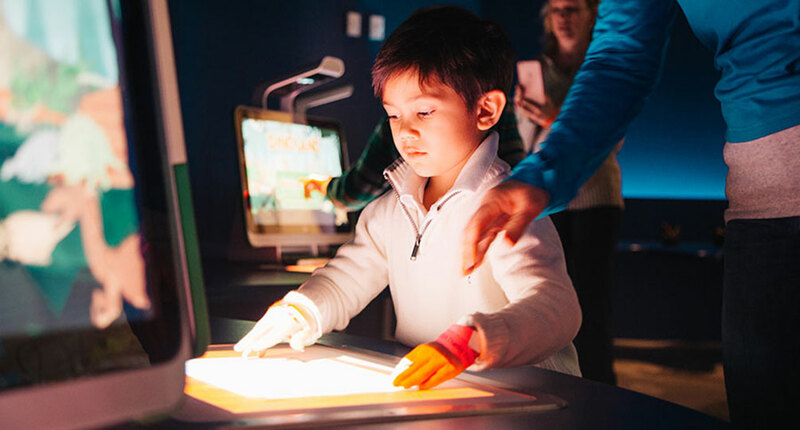 As part of their 75th anniversary, and integral to their decision to bring more technology to their museum, the Fort Worth Museum of Science and History (FWMSH) sought to update their DinoLabs exhibition hall. In collaboration with their creative team, Ideum created two new interactive exhibits for their DinoLabs. FWMSH began as a children’s museum, and were made famous for their stewardship of a complete skeleton of the Texas State Dinosaur, Paluxysaurus Jonesi. The DinoLand installation is a mixed reality experience that offers multiple layers of interaction. 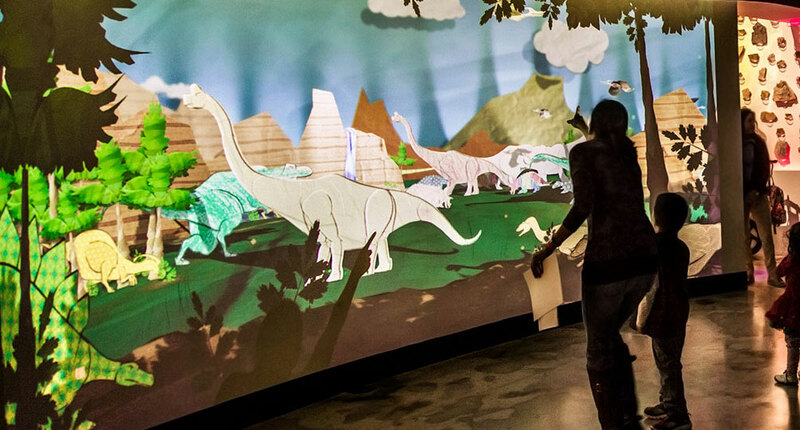 Visitors enter an immersive theater space to find a prehistoric scene projected on a large wall. The scene is intended to be playful and appealing to a younger audience, and evokes the aesthetic of paper dolls, dioramas, puppetry, and origami. Visitors get creative, using crayons or other media to fill in coloring pages that offer a selection of dino species. Using HP Sprouts for our scanning stations, visitors bring their creations to the scanners to capture the coloring pages. This application sends the colorful dinos into the projected scene where they fly and walk around, fully animated. This exhibit is comprised of two separate applications and integrates technology across multiple platforms. 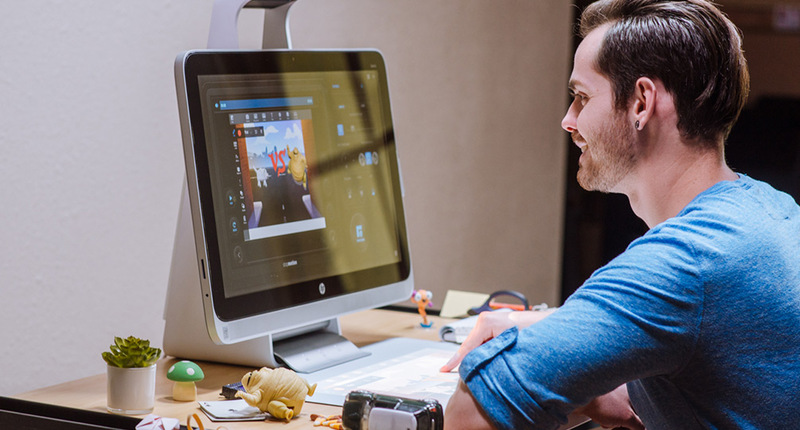 The scanning application was written for use with HP Sprout platform, while the projection application was developed in Unity 3D. This was a custom project, built specifically for this space. As part of the process, we built a matching curved wall in our Usability studio in order to fully prototype and test the exhibit prior to its installation. 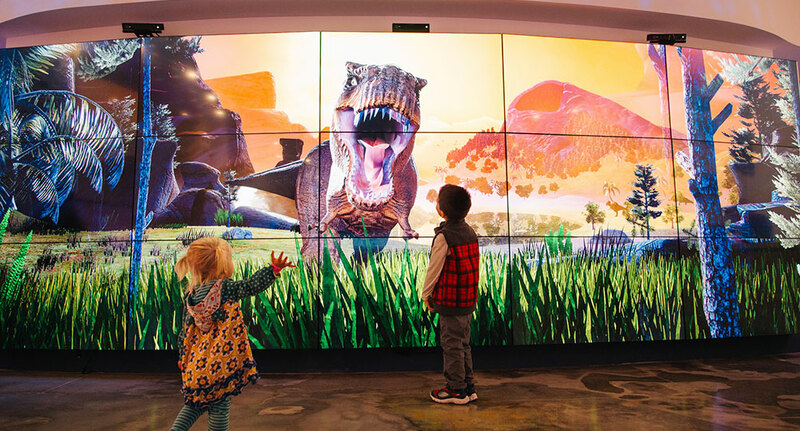 The second exhibit we designed with FWMSH is a 3D interactive video wall called DinoStomp. Guests see their creations come to life. A young visitor scans his drawing into the exhibit.